Hello from The Ritz-Carlton, Toronto! I’m attending the live global announcement of the upcoming changes to Starwood Preferred Guest, Marriott Rewards, and The Ritz-Carlton Rewards. As we’ve been anticipating for quite some time now, the three programs will be merging into one as a result of Marriott International’s acquisition of Starwood Hotels & Resorts back in 2016, and the date has been set for some of the new program’s features to kick in: August 2018. With all three programs moving under one roof, members will be able to enjoy seamless access to earn and redeem points at over 6,500 properties around the globe across 29 hotel brands, including such iconic names as St. Regis, The Ritz-Carlton, W, Westin, and JW Marriott. A press release detailing the upcoming changes was put out by Marriott just a few moments ago, detailing some of the key changes that are coming up as well as a rough timeline for these changes. Furthermore, Barry from Money We Have has conducted an interview with David Flueck, SVP of Global Loyalty at Marriott, and has additional information on the inner workings of the new program – including nitty-gritty details that will likely be of great concern to the readership of this blog, such as how free night redemptions will work and the fate of the spectacular Marriott Travel Packages. In this article, we’ll go through everything we know about the new combined program at this point in time, and I’ll provide you with all the in-depth analysis that you’ve come to expect here at Prince of Travel. The three programs will integrate in August 2018, and members will be able to combine their accounts into a single account within the new program, as well as book stays across the entire combined portfolio on any of the existing websites, apps, or call centres. A new program name will also be introduced. Elite status is changing, with new status tiers being introduced at the 10-night and 25-night levels. The full details on the new elite status arrangement will be detailed in the article below. Elite qualifying nights with SPG and Marriott will also be merged in August, and will be used to calculate your status within the new program. For example, if you have 20 nights with SPG and 30 nights with Marriott Rewards, come August, you’ll have a combined 50 elite qualifying nights, making you a newly minted Platinum member. Breakfast will only be available for Platinum and Platinum Premier members in the new program. Breakfast will be expanded to 25 participating brands, as well as resorts. A single points currency will be used for the unified program, and will be in line with existing Marriott Rewards points; accordingly, existing Starpoints will be tripled when members combine their accounts in August. Free Night Awards will be changing. First, a new standard award chart that encompasses all 29 brands will be introduced in August. Then, in 2019, peak and off-peak pricing will be introduced. Marriott Moments will be revamped, introducing a wide variety of experiences for members, including destination tours and activities, concerts, sporting events, and celebrity meet-and-greets, that can be redeemed with points. It’s business as usual until August, with no immediate changes to either SPG or Marriott; the only exception is the referral bonus on the Canadian Amex SPG credit cards (see below). Welcome gifts and lounge access now begin at the Platinum Elite level as well, similar to breakfast. 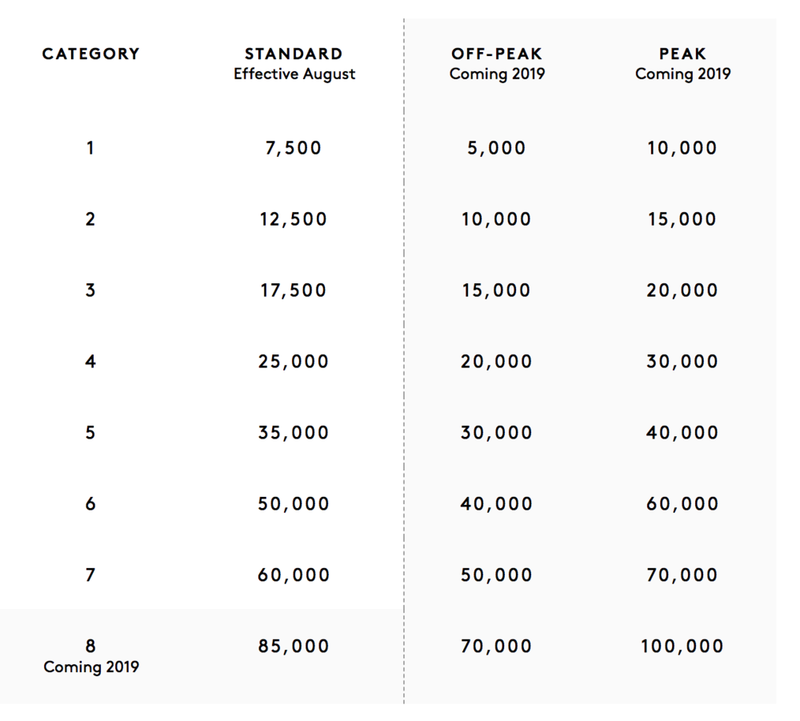 The new Free Night Awards chart will have 8 categories, from Category 1 (7,500 points per night) to Category 8 (85,000 points per night), although it seems that Category 8 will only come into effect in 2019. ALL hotels will be included in this chart, including Ritz-Carlton properties. The full chart is detailed in this article below. Exactly which dates count as peak or off-peak, as well as whether or not such information will even be published, is as yet unspecified. SPG’s airline transfer partners will remain in place. In fact, new airlines such as Qantas, Virgin Australia, Turkish Airlines, Aegean Airlines, JetBlue, and Air New Zealand will be introduced, for a total of 40 (!) partner airlines. Additionally, the current ratio for points transfers and the 25% bonus that SPG currently offers will remain in place as well. Marriott’s Flight & Hotel Packages will remain in place, although there will be changes to the points requirements; these changes are yet to be finalized. The Fifth Night Free benefit when booking hotel stays with points (i.e., book four nights and get a fifth night free) will remain in place. The ability to make points reservations without having the points in your account – an immensely useful feature under the current Marriott Rewards regime – will remain in place. The relationship with American Express Membership Rewards will also remain in place, including the ability to transfer points from Amex MR. The transfer ratio is yet to be confirmed. Lastly, the only change that’s coming to the American Express SPG Card and Business SPG Card here in Canada is that the referral bonus is changing to a $25 statement credit as of tomorrow, April 17. The signup bonus and minimum spending requirements remain the same. I’ve written extensively about why Marriott Rewards has recently emerged as the best hotel program for Canadians. With today’s announcement, there’s certainly a lot of upcoming changes to digest, but let’s take a look at each individual aspect of the program to see how things stack up against the good times that we’re enjoying at the moment. It’s worth bearing in mind that different segments of the travelling public will react to the changes in different ways; a road warrior whose company pays for hotel stays will view things very differently than a seasoned points expert who exclusively stays at hotels using rewards points. The latter perspective is probably more pertinent here at Prince of Travel, so I’ll address the major aspects of the new program in order of relative importance to those of us primarily looking to use points to score free hotel nights. We know that the Free Night Awards will be changing significantly. August 2018 will see the introduction of a new award chart spanning eight categories, from Category 1 hotels which require 7,500 points to Category 8 hotels which require 85,000 points. It’s worth noting that the highest category of hotels, Category 8, now requires significantly more points than the highest category under the current Marriott Rewards regime (Category 9 at 45,000 points a night), or even the Ritz-Carlton Tier system (Tier 5 at 70,000 points a night). Conversely, the best properties under the current SPG regime will see a reduction in price, from 35,000 Starpoints a night – equivalent to 105,000 Marriott Rewards points – down to 85,000 points a night. So for those of you eyeing free night redemptions at the world’s most luxurious hotels, there’s a mix of good and bad news: the Ritz-Carltons and JW Marriotts of the world will tend to get more expensive, while the St. Regises of the world will tend to become more reasonably priced. Some sort of equalization, like what we’re seeing here, was never in doubt. After all, once the 1:3 transfer ratio was put into place, there was a huge imbalance between the amount of points required to book Marriott and SPG’s top properties (45,000 Marriott Rewards points vs. 35,000 Starpoints, respectively). The integration of three rewards programs into one was always going to come with some kind of rebalancing in terms of how much an award night costs. We don’t know how many hotels will be placed in each category, so it’s hard to comment at this point on how good or bad the rest of the Free Night Award chart looks. But we do know that Marriott plans to introduce peak and off-peak pricing in 2019 on the basis of the new standard award chart. It has been confirmed that the peak and off-peak dates will be controlled by Marriott hotels behind-the-scenes. Hotels will be able to set their peak and off-peak periods based on anticipated demand in the local area. This would cut into the value you get by, say, redeeming points for a stay over popular periods like New Year's Eve, although it’s definitely good news that the peak rate would only be, on average, a roughly 20% increase from the standard rate. For those of us who like to fund our hotel stays using points as much as possible, the ability to easily earn those points is obviously paramount. In that respect, the good news is that the American Express SPG Card and the Business SPG Card aren’t going away as some people have feared, but there will be some changes to the signup and referral offers. Furthremore, the referral bonus on these cards is changing. As of today, April 16, you get 5,000 Starpoints if you refer a friend to either the personal or business version of the SPG Card. That’s changing tomorrow, April 17 – it’s going to be a relatively paltry $25 statement credit per referral instead. Amex has confirmed that this is a temporary arrangement in light of the SPG program being phased out and the new program taking the spotlight; I’m confident that when all is said and done, the bonuses on the new program’s co-branded card will become competitive once again. Nonetheless, the current state of affairs is a bit of a joke. These credit cards are no longer worth much in terms of signup bonuses, given that you'll be paying $120 to $150 in annual fees and only getting back up to $250 in statement credits. As for the referral bonus, a $25 statement credit is laughably low – you’d be better off going via Great Canadian Rebates and getting a $30 rebate instead for the personal version – and certainly a huge decrease from the incumbent referral bonus of 5,000 Starpoints. If you were planning to refer a friend (or use someone’s referral link to apply), do it today, before the decrease kicks in! The other thing people have been concerned about when it comes to earning points is the ability to transfer Amex Membership Rewards points to SPG at a 2:1 ratio. While Amex has confirmed that the ability to transfer points to the new program will be kept, and that there will be no breakage in this ability (i.e., no period when this ability is suspended or deactivated), they have yet to confirm the ratio of points transfers. In an ideal world, we would see a fair and square 2:3 ratio, given that 1 Starpoint is equivalent to 3 Marriott Rewards points. However, I can also envisage a scenario in which Amex decides a 1:1 ratio would be best; fingers crossed that they don’t go down that route. Lastly, although it’s pretty much 90% certain, there hasn’t been an official announcement that Amex will remain the credit card partner for the new program here in Canada. I say it’s 90% certain because the only other real contender, Chase, has exited the Canadian market earlier this year. Time will tell for sure, but until the announcement is made by either Amex or Marriott, there’s still time for an underdog to swoop in and gazump the deal. One of the reasons I’ve been singing the praises of Marriott Rewards is that its Gold Elite status is both really easy to obtain and really generous. Just by being a cardholder of the Amex Platinum or the Business Platinum, you get SPG Gold Elite status as one of your perks, and that translates into instant Marriott Gold Elite status. This, in turn, gets you free breakfast and executive lounge access at Marriott hotels. Under the new program, elite members are more stratified; you now have five elite tiers (Silver, Gold, Platinum, Platinum Premier, Ambassador) rather than three (Silver, Gold, Platinum). This allows Marriott to “give away” the easier status levels to co-branded credit card holders without diluting the pool of desirable benefits and causing overcrowding in their executive lounges. While nothing’s been confirmed yet, I think it’s safe to assume that Amex Platinum cardholders will continue to enjoy Gold Elite status. However, Gold Elite now only gets you a basic level of preferred treatment (accelerated points earning, 2pm late checkout, etc.) rather than breakfast and lounge access. But don't worry just yet: the good news is that existing Marriott Gold Elite members will be automatically transitioned to Platinum Elite as of August, so you'll enjoy the premium benefits until at least January 2019. Having said that, if you look at things from the viewpoint of someone who actually earns elite status by frequently staying with the hotel (I know, who are those crazy people?! ), then very little is actually changing. In the new program, Platinum Elite, at 50 nights, will be the first level that comes with the most tangible benefits (i.e., breakfast and lounge access); under both Marriott and SPG at the moment, 50 nights also what’s required to reach those same tangible benefits. And on the bright side, once the programs move under one roof, you’ll have a much wider range of hotels where you can earn your qualifying nights, which should make obtaining and keeping your status an easier proposition. Lastly, the fact that the breakfast benefit being extended to resorts is a huge win, and makes redeeming points at resorts that much more compelling if you’re going to qualify for Platinum Elite under the new rules. Several other standout features of Marriott Rewards and SPG made these programs the first place I look these days when I need to book a hotel. These include the flexibility of SPG’s airline transfers with 30+ partners, the Fifth Night Free benefit when redeeming points, the insane value provided by Marriott’s Flight & Hotel Packages, and the ability to make bookings on points with Marriott Rewards without having the points in your account yet. In my opinion, the fact that none of these features is going away is worthy of celebration. Having said that, we don’t know the specifics of which airline partners will be available and what the Flight & Hotel Package chart will look like, so it’s a bit early to comment on the value they provide. We do know that the direct airline partner transfers (currently under SPG) will retain their transfer ratios as well as their 25% bonus, while the Flight & Hotel Package will see some changes in the number of points required (and perhaps the number of frequent flyer miles awarded as well). Until August, however, you are still able to redeem packages at the extremely valuable rates that are available now. Below is a summary of the questions that remain, the answers of which will be filtering through in advance of the new program’s start date. I’ll be updating this post with new information should it trickle out in the next couple of days, although I’m sure we’ll get something like an official fact sheet from Marriott between now and August, which will receive detailed coverage here on the blog as always. Which hotels will fall in which category on the Free Night Award chart? What will be the new Flight & Hotel Package redemption chart? Will Amex Canada issue brand-new credit cards for the combined program? What will be the signup bonus? What will happen to existing SPG cardholders? What will be the transfer ratio from Amex Membership Rewards to the new Marriott program? Since day one after the merger, Marriott has reassured us time after time that they intend to leverage “the best of both worlds” in combining their own loyalty program with SPG. Based on the initial announcement of the upcoming changes, I think it’s fair to say they’ve kept their word. Excellent features in both programs, such as airline transfers, Fifth Night Free, and Flight & Hotel Packages, look to have been retained, with only a few obvious imbalances in terms of Free Night Awards and elite status benefits being corrected. I look forward to finding out the full details of the program in order to truly delve into its sweet spots and share with you all my findings!